German company Drettmann Yachts announces two new orders in its Explorer series. Revealed to the public in 2011, the Drettmann Explorer Yacht (DEY) series now offers a complete range from 20m to 45m. These robust and voluminous yachts are styled by Focus Yacht Design. New to the range, the first order is for a 24m explorer yacht. This hull is already under construction in Netherlands but no other details are known for the moment. The second order is for the already known DEY 32. Built in steel and aluminium, this 32.95m explorer yacht accommodates 10 guests in five cabins. Working on exclusivity contracts, Drettmann didn't give us the shipyard names where these projects are or will be built. We will give more details as soon as it is possible. 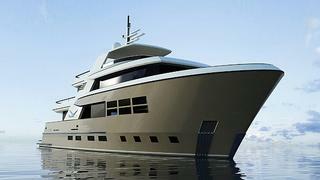 Both Drettmann Explorer yachts will be delivered by the end of 2014. Note also that the keel of the first Drettmann Motor Yachts (DMY) is about to be laid.